Shapiro: Marshall JMP Master Volume amps from ’76-’77 seem to have less gain but still plenty, while the ones from ’78-’81 have more gain. These are supposed to be identical to the later JCM800. I believe the JCM used different but same-value chiclet caps that make them brighter. The JMPs are warmer and more woody, less brittle and just more mojo. 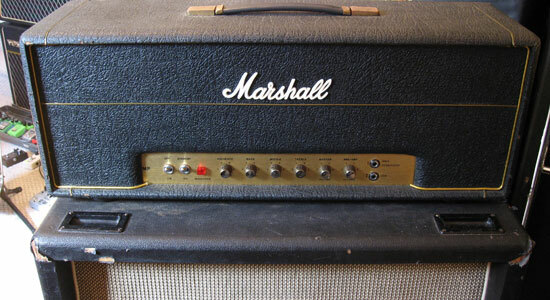 I am a complete gear whore and have purposely been using everything but Marshalls, as I like to use oddball stuff, but something about this era Marshall feels so right to me. I discovered these while on tour with Redd Kross as they request these when renting backline in each city. When I got home I sold my modern channel-switching amps and went all JMP. They seem to be a perfect match for the Redd Kross material. Also the best speaker match I found are the vintage Celestian G12-65 but the G12M black or greenback is great, too, and my second choice. Most rental cabinets will have newer G12T-75s, which are OK and a basic get-the-job-done utility speaker, but the former two mentioned sound sweeter to me. The U.S. models shipped with the 6550 tubes and the U.K. version used EL-34. I have one with each. Lots of people convert the 6550s to EL-34 as that’s the more classic Marshall sound we all know and love. I really like the 6550s in my 1977 50-watt as they sound very round and fat so I’m leaving them in there. The 1979 100-watt has EL-34s and sounds killer as well. The 50-watt is every bit as loud as the 100 but just has a different attack to the note and breaks up sooner at lower volumes. You can also swap out the preamp tubes for different results. On the 50-wattt I put in some vintage Mullard 12ax7s in V1 then Brimar in V2 with excellent results. I tried the same on the 100 and the cheap newer Sovteks sounded better. Hopefully Marshall reissues the Master Volume JMP. They may claim the reissue JCM800 is the same circuit so why bother. I think I’m not alone in saying they sound way different from each other.